On March 10th, I announced a new thing I was doing, the “Top Read and Tweeted Kindle Books” list. Well, I set it up using Twitter’s RSS feeds as the source, and they turned those off earlier this week. I think I could probably redo it using Twitter’s API (which is probably how it should have been done in the first place, but I was more familiar with the other way), but realistically, that would take me time that would be better used for other things, especially since I haven’t gotten any comments on this thing since I launched it, and I was probably the only one looking at it. So, goodbye Top Book thing. It was fun while it lasted! It was actually interesting to watch over the past three months though. Click to embiggen if you want. Gone Girl and Gatsby swapped a bit before Gatsby took the clear lead. Inferno is obviously crushing everybody at the moment. 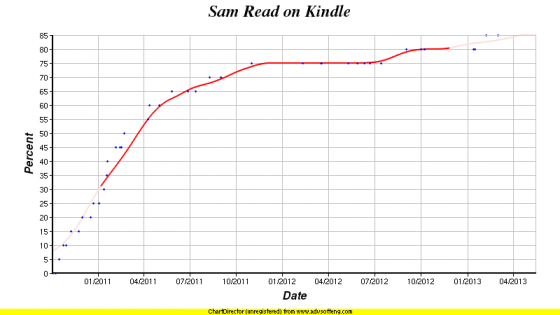 Almost 2% of everybody tweeting they finished a Kindle book recently were tweeting about finishing Inferno. If anybody else out there would miss this though, let me know of course. :-)Anyway. Fun stuff. I would have had fun continuing to track this for awhile. But as I mentioned, probably not worth fixing. Time to put out the results of one of my latest projects. It is currently set to update automatically every hour. Over the last few months, 15-30 minutes at a time, as I had a few moments, I’ve been working on putting something together that I’d been curious about for a long time. 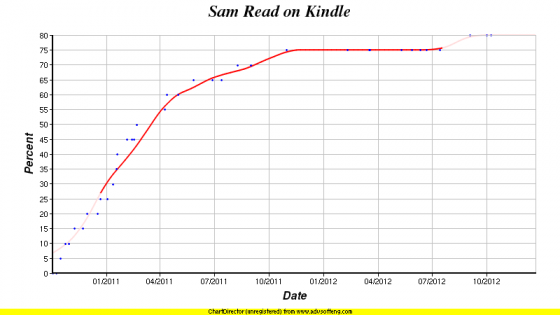 Namely, a while back a feature was added to Kindles to share that you had finished a book. When you get to the last page of a book, it asks you if you want to put a note on Facebook or Twitter that you have finished the book. This naturally leads one to wonder… well, at least it leads me to wonder… which books people are finishing and how that compares to standard lists of what books people are buying. After all, probably most books that are bought do NOT actually get read, certainly not all the way through. These social media posts might give at least some window into that. Now, to be clear, in the end, looking at these can NOT tell you about what people are reading. 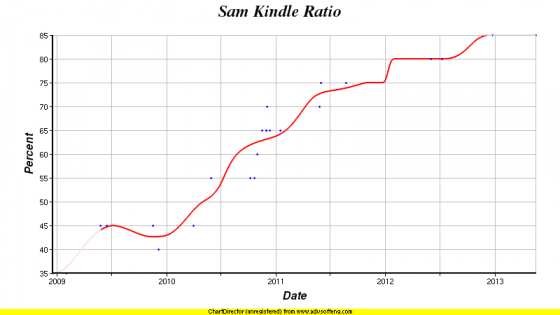 For one thing, it is just Kindle books. 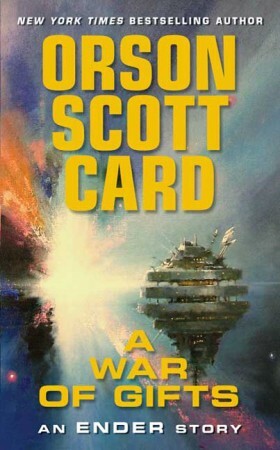 For another thing, it is only people who bother to connect their social sites to their Kindles. And then it is only the books that they choose to share publicly… there is surely lots of reading people just don’t want to share. But I thought it would be interesting anyway. I concentrated on the Twitter side because I thought I had an idea how to do that. When people finish their books they can choose to edit and customize what they Tweet, but if they don’t, then the tweets have a standard format, and I could grab and parse those tweets. 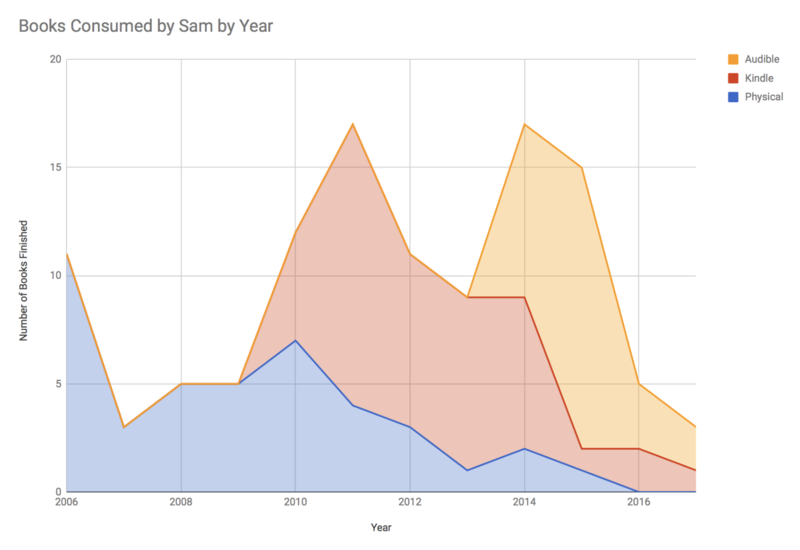 So I started collecting and grabbing that data. Then I set up stuff to remove as much of the “extra” stuff in the tweets as I could (although when people add custom stuff, I can’t really catch that), and then do some sorting and counting and such to come up with a ranked list. 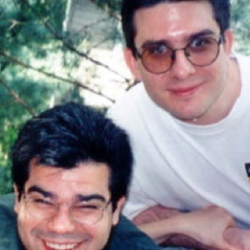 The parsing is by no means perfect, but it is good enough for now. 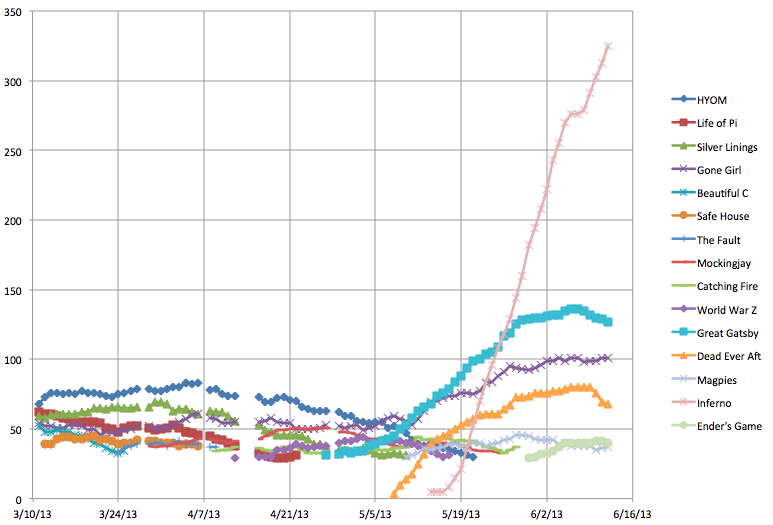 I tried looking at the last 10,000 tweets, but there were still way too many ties in the top 20. So I looked at the last 20,000 tweets, but given the current rate of these tweets you would have to go back farther in time than I wanted, so it would be pretty slow to respond to changes. For now I’ve settled at the last 16,384 tweets. Why 16,384? I am a geek, it is a power of two, it is between 10,000 with too many ties, and 20,000 with too much time, and at the current rate of tweeting it is pretty close to a month of tweets. In any case, I put the last tweaks on this in the last 24 hours, and I figure now it is ready to go live. Data as of 2013-03-10 20:00:16 UTC, covering 16384 tweets over 31.96 days. Includes tweets from 2013-02-06 20:54:17 UTC to 2013-03-10 19:58:16 UTC. And there it is. 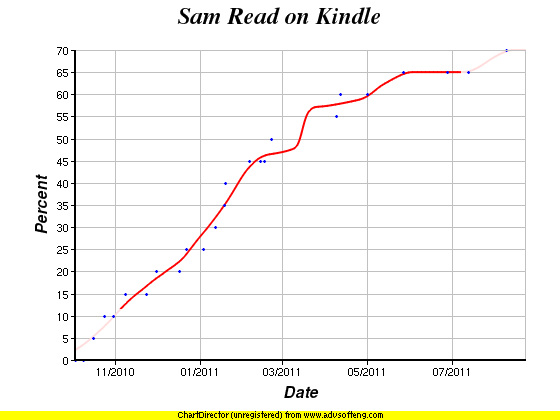 Not quite the same as the bestseller lists, but fun to look at and see how it changes over time. Oh, and yes, I know that it would be trivial to manipulate this list, since it just counts tweets in a specific format, and anybody could tweet as many tweets as they wanted in that format, no reading of a book required. But hey, still fun. 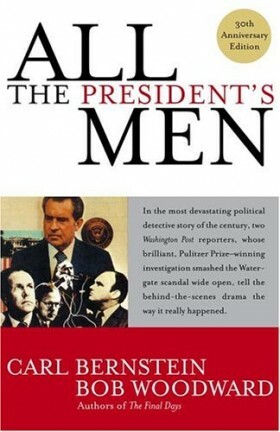 Call for Romney Supporters / EC Update / Debate Preview / Coattails? Sigh, once again I let things go way too long. I’ve been busy with other things. But since I’m stuck at hotel after a cancelled plane flight, I’ll maybe catch up on some old stuff. 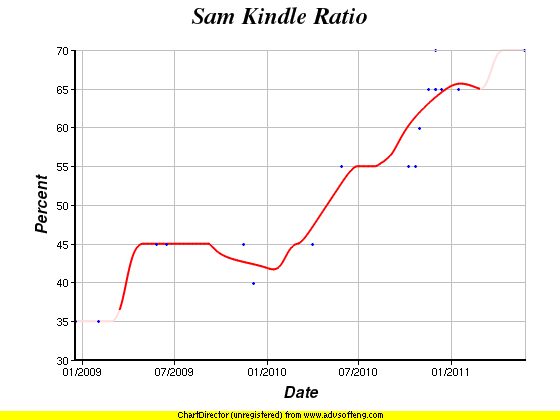 I actually got my Kindle after that ratio hit 50%. So here also is the ratio of how many of the last 20 books I’ve read (not necessarily reviewed yet) that I’ve actually read on Kindle. This is up to 75% now. I’ve said I’ll continue doing these posts until each of the charts hits 90%. OK, I’m way behind, but as of soon after I posted my review of NurtueShock (August 22nd to be specific), here is where things stood. 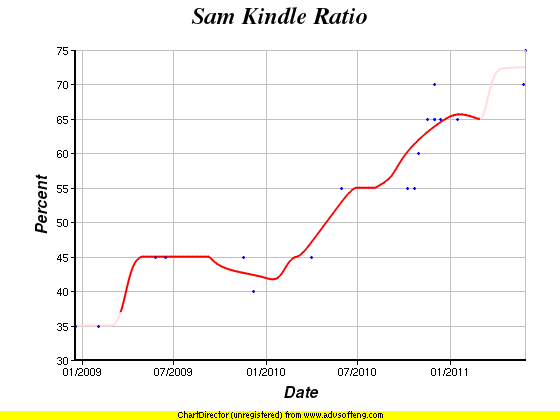 Percent of the last 20 books I’ve posted reviews for available on Kindle stays at 75%. 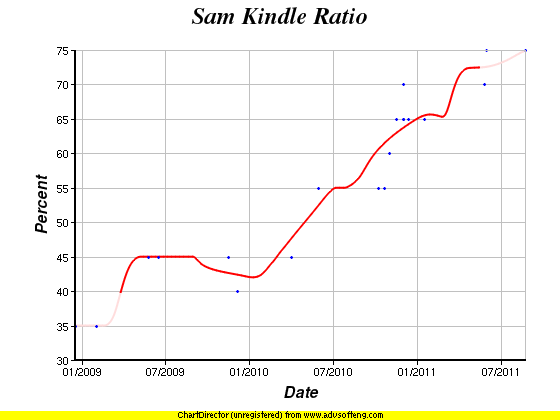 And the percentage of the last 20 books I’ve actually read (at least as of Aug 22) on Kindle goes up to 70%. 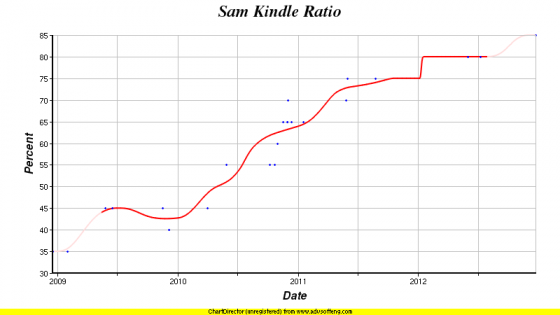 Percent of the last 20 books I’ve posted reviews for available on Kindle is now up to 75%. 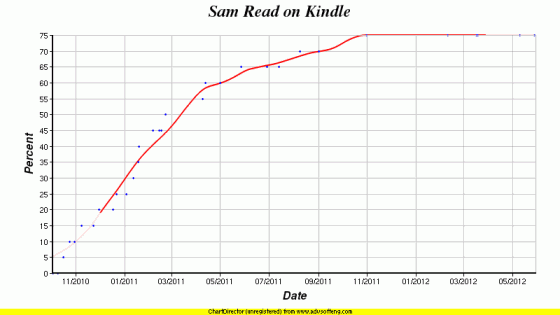 And the percentage of the last 20 books I’ve read available on Kindle stays at 65%. 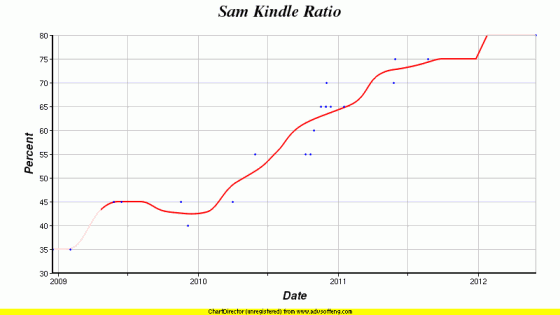 First, percentage of the last 20 books I have REVIEWED that are currently AVAILABLE on Kindle (so this doesn’t include the 13 books I have read but haven’t yet reviewed) – This is now at 70%. 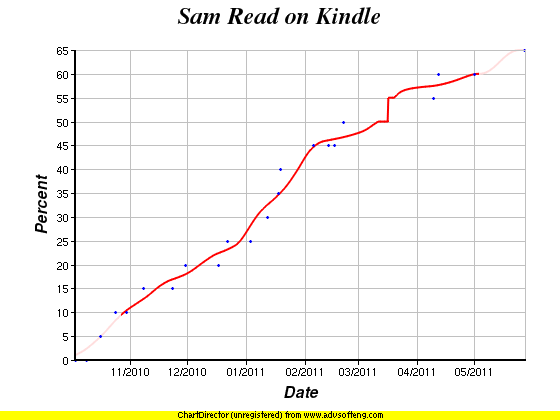 Next, the percentage of the last 20 books I have READ that I actually READ on the Kindle (this does include the 13 books I have read but have not yet reviewed) – This is now at 65%. By the way, I think I’ll discontinue posting about these charts when/if each hits 90%.